Dutch Still Life Painter, Utrecht School, Famous for Vanitas Still-Lifes. A member of the Utrecht school of 17th century Dutch painting and one of the great European specialists in still-life painting, rendering flowers, fruits, lobsters, butterflies, stones and metals with exquisite accuracy, Jan Davidsz de Heem frequently imbued his subject matter with moral symbolism and religious overtones. He is best known for his vanitas still life painting - a new form of Protestant Reformation art, which he executed in muted greys and ochres. He also painted still-lifes surrounded by books, papers and pictures. Celebrated as one of the great Dutch Realist artists, he is also claimed by the Flemish school. Over one hundred of his paintings hang in some of the best art museums across the world, but only a handful are dated, so an accurate chronology of his work is next to impossible. Famous examples of De Heem's style of Dutch Realism include A Table of Desserts (1640, Louvre, Paris) and Festoon of Fruit and Flowers (c.1660, Rijksmuseum, Amsterdam). A Table of Desserts (1640) Louvre. form of the Chinese porcelain dish. De Heem was born in Utrecht in 1606. His father, David de Heem (1570-1632) was also a well known painter, and Jan studied drawing and oil painting under his guidance. De Heem then progressed to studying under Balthasar van der Ast. Van der Ast (1593-1657) specialised in still life works of fruit, flowers, insects and lizards, as well as shells - he was in fact considered a pioneer in the genre of shell painting. Between 1625 and 1629 de Heem lived in the town of Leiden, studying under the artist David Bailly (1584-1657) who was a painter of vanitas still lifes and portraits. In 1669 de Heem was made part of the Utrecht Guild, but moved to Antwerp in 1672 and remained there until his death. Some of de Heem's early paintings of still-lifes show a technique not too dissimilar to Aelbert Cuyp. As the years progressed, de Heem's style however developed into something very original. His painting became so popular, that his workshop was always busy, and in later years his sons would help to fulfil those orders. An early painting, now in a private collection is Festoon with Fruit and Flowers (c.1650's), depicting a feast of luscious oranges, grapes and peaches tied together with a ribbon. Another of his works in the Louvre is A Table of Desserts (1640), a beautiful setting of food laid out on a table for a feast. The table is laid with expensive fruit, precious metal vessels and delicate glassware. This painting was originally in the collection of Louis XIV. Apparently one of the reasons de Heem may have moved to Antwerp was because 'there, one could have rare fruit of all kinds, large plums, peaches, cherries, oranges, lemons, grapes, and others in finer condition and state of ripeness to draw from life ...' De Heem's brushstrokes became looser as his skill developed, and he introduced chiaroscuro effects. His choice of subject and arrangements were influenced by his friend the Flemish painter Daniel Seghers (1590-1661), who along with Jan Brueghel was one of the most skilled flower painters in the country. In general, De Heem's technique encompassed the best of Flemish Baroque art of the time, and he became one of the best still life painters in Antwerp. In fine art, Vanitas is a type of symbolic painting associated with Northern European still life painting, particularly Flemish, during the 16th and 17th centuries. The word is Latin and roughly translates as 'emptiness', and refers to the transient nature of earthly life. Originally vanitas paintings were popular in funerary art, and took the form of sculptures on tombs. 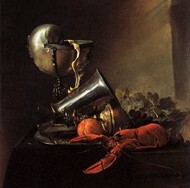 However, by the 16th century, the idiom became more common in painting, in particular still-life. The genre was used to symbolically remind people of the transient and fleeting nature of life. Common symbols were skulls, fruit (often rotting), hour-glasses and watches. Flowers and butterflies were interpreted to show how beautiful life is, but temporary. Sometimes lemon peels were used  attractive to view, but bitter to taste. De Heem enjoyed the possibilities and symbolic messages of vanitas. Wonderful examples include: Flower Still-life with Crucifix and Skull (1630s, Alte Pinakothek, Munich); Vanitas Still-Life with Musical Instruments (c. 1660's, Rijksmuseum, Amsterdam) and Still-Life with a Peeled Lemon (1650s, Louvre, Paris). 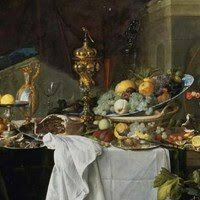 Other influential vanitas painters included Harmen van Steenwyck (1612-56), Willem Kalf (1622-93), Willem Claesz Heda (1594-1681), Pieter Claesz (1597-1660) and de Heem's son Cornelis. This was a specialised category in the still-life genre, originally developed by Jan Brueghel and Federico Borromeo, and improved by Daniel Seghers. Seghers was part of the Jesuit order, and tried to recover the spiritual symbolism of flowers. He particularly encouraged other artists to arrange flowers in a garland around a niche in a wall, which could contain a communion chalice. De Heem's version, Eucharist in Fruit Wreath (1648, Kunsthistorisches Museum, Vienna) is beautifully rendered, his paint exceptionally luminous. His wreath contains apples, pears, maize and figs, all rendered in amazing detail. De Heem died in 1683 and was succeed by his son Cornelis de Heem, a highly successful painter in his own right. One of the great exponents of still life and Dutch Realist genre painting, De Heem's paintings were copied by generations of artists after him, most famously by Henri Matisse who was inspired to create his Variation on a Still Life by de Heem (1915, Museum of Modern Art, New York). Other followers included Abraham Mignon, a Dutch Golden Age painter who specialised in flower paintings. De Heem's paintings can been seen in collections in the Rijksmuseum, Amsterdam; Alte Pinakothek, Munich; Metropolitan Museum of Art, New York and the Wallace Collection, London.